Steve is a Scottish actor, musician and magician who has performed on stage and screen, but is best known for his role as the eccentric Nigel Townsend on NBC‘s crime drama Crossing Jordan. Currently he stars in the Disney XD sitcom I’m in the Band as Derek Jupiter. 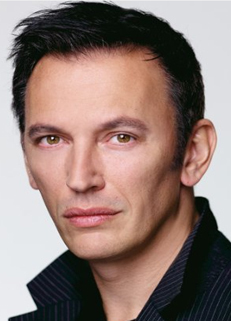 Steve Valentine has been seen in films such as Tim Burton‘s Mars Attacks! and Foreign Correspondents, and has guest-starred on shows such as House M.D., Monk, Just Shoot Me, Will and Grace, Dharma & Greg and Charmed. He appeared as an art critic in Ringo Starr‘s Discover Card “Private Issue” commercials in 1995. Valentine hosted theSci-Fi Channel’s reality show Estate of Panic. He voiced the character of Alistair in Dragon Age: Origins as well as the character of Harry Flynn in the video game Uncharted 2: Among Thieves. Beyond movies, Valentine is a rather accomplished magician,using this skill to occasionally portray magicians. He also is Mr. Moore in the recently aired Disney Channel movie Avalon High. His second Disney Channel Movie, the first being Don’t Look Under the Bed. And he also was in Wizards of Waverly Place: The Movie.